I've been using this set for a few weeks now, and I figured it was time to do a review. I think this has been the longest I've tested something before blogging about it. I also haven't had the chance to jump on the computer in awhile, and I still can't figure out how to post more than one picture when I'm using the blogger app on my phone. And forget the browser version. Anyway! 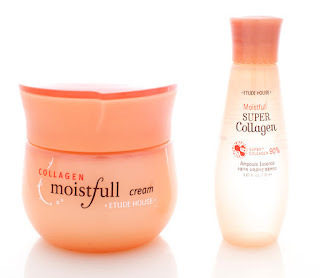 I've seen this Etude House set a few times, and I figured because it was called "Moistfull" it just might be something my dry skin needs. And I'm glad I've found it! The set isn't very big. This kit actually turned out to be a jar of their Collagen Moistfull Cream and a small 20mL sample of the Moistfull Super Collagen Ampoule Essence. I've been using both of these in my day time and night time routines. 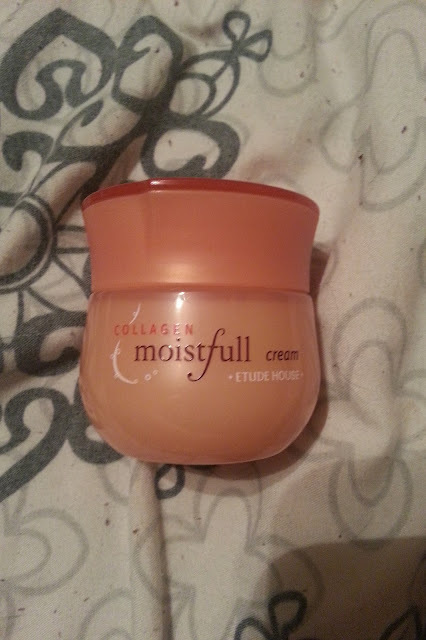 The Collagen Moistfull Cream is more of a gel than an actual cream (I should have taken a picture of it) - it's not very thick and absorbs pretty quickly. It isn't greasy either, which is nice. However, I would say it doesn't provide as much moisture as I thought it would. On it's own, it's not a very good product. But, paired with the ampoule, they work well as a team. See how small that ampoule is!? I thought it would run out quickly, but I still have a decent amount left in that small bottle, and I use it twice a day! This is the star of the two products. I find this provides some moisture, and most importantly, it makes my face FEEL hydrated. Without using this, and only using the cream, you can see some dry patches when I apply makeup. In the morning I will usually tone my face (I try not to wash it because it makes it more red, and I've seen that it's not very good for dry skin to wash it twice a day - anyone else hear this before?) then apply this essence, and then apply the moistfull cream. I was using the Younique moisturizer before but it's empty. Plus, I wanted to really give this set a try. At night time I will double cleanse my face - first with the clean it zero balm, and then younique clean cleanser. After that I will tone my face with TheFaceShop Rice Ceramide Moisture Toner, then apply this essence, and then follow with some other products. This seems to have been working for me at night because my face just feels wonderful, inside and out lol. So between the two products, I really liked the ampoule essence. I actually purchased a full size bottle, which I will open once I finish this sample. I think I will probably finish it by the end of the month. 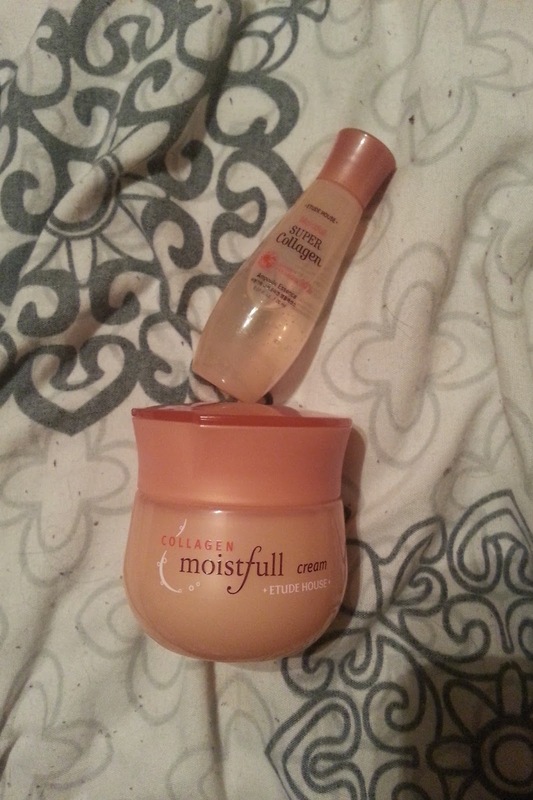 I wouldn't repurchase the moistfull cream because I feel it doesn't work without the essence, and I have some other moisturizers to give a shot. I have never heard not to wash your face in the morning, but if it's working for you that's good. 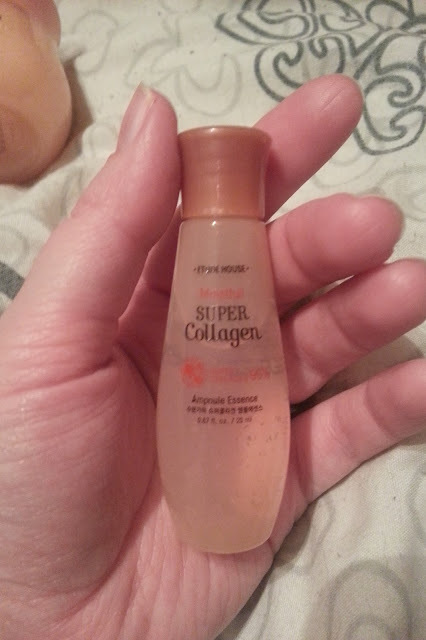 I really like this ampoule - nice and moisturizing! I've read that its not good because it messes with your oils, and the barrier of your skin. I'm not sure how true it is. I've been loving how moisturizing this ampoule is, and it's super affordable!